Ursula K. Le Guin, one of the significant writers of soft science fiction. Soft science fiction, or soft SF, is a category of science fiction with two different definitions. It explores the "soft" sciences, and especially the social sciences (for example, anthropology, sociology, or psychology), rather than engineering or the "hard" sciences (for example, physics, astronomy, or chemistry). It is not scientifically accurate or plausible; the opposite of hard science fiction. Soft science fiction of either type is often more concerned with character and speculative societies, rather than speculative science or engineering. The term first appeared in the late 1970s and is attributed to Australian literary scholar Peter Nicholls. Peter Nicholls, the first person attested to have used the term soft science fiction. In The Encyclopedia of Science Fiction, Peter Nicholls writes that "soft SF" is a "not very precise item of SF terminology" and that the contrast between hard and soft is "sometimes illogical." In fact, the boundaries between "hard" and "soft" are neither definite nor universally agreed-upon, so there is no single standard of scientific "hardness" or "softness." Some readers might consider any deviation from the possible or probable (for example, including faster-than-light travel or paranormal powers) to be a mark of "softness." Others might see an emphasis on character or the social implications of technological change (however possible or probable) as a departure from the science-engineering-technology issues that in their view ought to be the focus of hard SF. Given this lack of objective and well-defined standards, "soft science fiction" does not indicate a genre or subgenre of SF but a tendency or quality—one pole of an axis that has "hard science fiction" at the other pole. In Brave New Words, subtitled The Oxford Dictionary of Science Fiction, soft science fiction is given two definitions. The first definition is soft science fiction that is primarily focused on advancements in, or extrapolations of, the soft sciences; that is social sciences and not natural sciences. The second definition is science fiction in which science is not important to the story. The term soft science fiction was formed as the complement of the earlier term hard science fiction. The earliest known citation for the term is in "1975: The Year in Science Fiction" by Peter Nicholls, in Nebula Awards Stories 11 (1976). He wrote "The same list reveals that an already established shift from hard sf (chemistry, physics, astronomy, technology) to soft sf (psychology, biology, anthropology, sociology, and even [...] linguistics) is continuing more strongly than ever." H. G. Wells, an early example of a soft science fiction writer. Poul Anderson, in Ideas for SF Writers (Sep 1998), described H. G. Wells as the model for soft science fiction: "He concentrated on the characters, their emotions and interactions" rather than any of the science or technology behind, for example, invisible men or time machines. Jeffrey Wallmann suggests that soft science fiction grew out of the gothic fiction of Edgar Allan Poe and Mary Shelley. 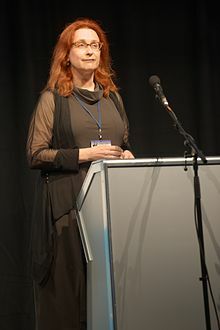 Carol McGuirk, in Fiction 2000 (1992), states that the "soft school" of science fiction dominated the genre in the 1950s, with the beginning of the Cold War and an influx of new readers into the science fiction genre. 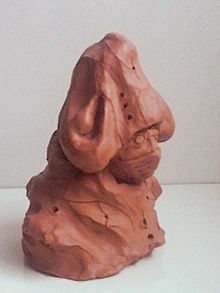 The early members of the soft science fiction genre were Alfred Bester, Fritz Leiber, Ray Bradbury and James Blish, who were the first to make a "radical" break from the hard science fiction tradition and "take extrapolation explicitly inward", emphasising the characters and their characterisation. In calling out specific examples from this period, McGuirk describes Ursula K. Le Guin's 1969 novel The Left Hand of Darkness as "a soft SF classic". The New Wave movement in science fiction developed out of soft science fiction in the 1960s and 70s. The conte cruel was the standard narrative form of soft science fiction by the 1980s. During the 1980s cyberpunk developed from soft science fiction. McGuirk identifies two subgenres of soft science fiction: "Humanist science fiction" (in which human beings, rather than technology, are the cause of advancement or from which change can be extrapolated in the setting; often involving speculation on the human condition) and "Science fiction noir" (focusing on the negative aspects of human nature; often in a dystopian setting). Audrey Niffenegger, author of the soft science fiction work The Time Traveler's Wife. George Orwell's Nineteen Eighty-Four might be described as soft science fiction, since it is concerned primarily with how society and interpersonal relationships are altered by a political force that uses technology mercilessly; even though it is the source of many ideas and tropes commonly explored in subsequent science fiction, (even in hard science fiction), such as mind control and surveillance. And yet, its style is uncompromisingly realistic, and despite its then-future setting, very much more like a spy novel or political thriller in terms of its themes and treatment. Karel Čapek's 1920 play R.U.R., which supplied the term robot (nearly replacing earlier terms such as automaton) and features a trope-defining climax in which artificial workers unite to overthrow human society, covers such issues as free will, a post-scarcity economy, robot rebellion, and post-apocalyptic culture. The play, subtitled "A Fantastic Melodrama," offers only a general description of the process for creating living workers out of artificial tissue, and thus can be compared to social comedy or literary fantasy. George S. Elrick, in Science Fiction Handbook for Readers and Writers (1978), cited Brian Aldiss' 1959 short story collection The Canopy of Time (using the US title Galaxies Like Grains of Sand) as an example of soft science fiction based on the soft sciences. Frank Herbert's Dune series is a landmark of soft science fiction. In it, he deliberately spent little time on the details of its futuristic technology so he could devote it chiefly to addressing the politics of humanity, rather than the future of humanity's technology. Linguistic relativity (also known as the Sapir–Whorf hypothesis), the theory that language influences thought and perception, is a subject explored in some soft science fiction works such as Jack Vance's The Languages of Pao (1958) and Samuel R. Delany's Babel-17 (1966). In these works artificial languages are used to control and change people and whole societies. Science fictional linguistics are also the subject of varied works from Ursula K. Le Guin's novel The Dispossessed (1974), to the Star Trek: The Next Generation episode "Darmok" (1991), to Neal Stephenson's novel Snow Crash (1992). Presence of gravity without use of an artificial gravity system. A spaceship's engines or an explosion generating sound despite the vacuum of space. Spaceships changing directions without any visible thrusting activity. Spaceship occupants enduring without any visible effort the enormous g-forces generated from a spaceship's extreme maneuvering (e.g. in a dogfight situation) or launch. Astronauts preferring the agonizing death by hypercapnia over the painless death by hypoxia, given that the latter can be easily achieved by slowly releasing the spaceship's atmosphere into outer space. Spacecraft which suffer engine failures "falling" or coming to a stop, instead of continuing along their current trajectory or orbit as per inertia. Hard science fiction films try to avoid such artistic license. Planet of the Apes old book cover. Arranged chronologically by publication year. Episodes of Star Trek: The Next Generation (1987–1994) like the fifth season's "Darmok" (S5E02; September 30, 1991) are based on soft science concepts; in this case, linguistics. ^ "Soft SF". Encyclopedia of Science Fiction. 2011-12-20. ^ "science fiction (literature and performance) - Encyclopædia Britannica". Britannica.com. Retrieved 2013-09-09. ^ "Soft SF," Encyclopedia of Science Fiction, ed. John Clute and Peter Nicholls, 1995, ISBN 0-312-13486-X. ^ a b c d Prucher, Jeff, ed. (2007). Brave New Words. Oxford University Press. p. 191. ISBN 9780195305678. ^ a b c Prucher, Jeff; Farmer, Malcolm (6 July 2008). "Soft science fiction (n)". SF Citations for OED. Retrieved 2014-05-21. See also the alternative Soft science fiction (n) Archived 2007-09-27 at the Wayback Machine for the second definition. ^ Wallmann, Jeffrey M. (1997). Wolf, Milton T., ed. Evolutionary Machinery: Foreshadowings of Science Fiction in Bernard Shaw's Dramas. Shaw and Science Fiction. Penn State Press. p. 81. ISBN 9780271016818. ^ a b c d e f g h i j k l m n o McGuirk, Carol (1992). "The 'New' Romancers". In Slusser, George Edgar; Shippey, T. A. Fiction 2000. University of Georgia Press. pp. 109–125. ISBN 9780820314495. ^ Caroti, Simone (2011). The Generation Starship in Science Fiction. McFarland. p. 156. ISBN 9780786485765. ^ Brian M. Stableford (1 January 2004). Historical Dictionary of Science Fiction Literature. Scarecrow Press. pp. 73–. ISBN 978-0-8108-4938-9. ^ a b Stableford, Brian (2006). Science Fact and Science Fiction. Taylor & Francis. p. 227. ISBN 9780415974608. ^ a b Duvall, John N., ed. (2012). The Cambridge Companion to American Fiction After 1945. Cambridge University Press. p. 59. ISBN 9780521196314. ^ a b c d e Bertens, Hans; D'haen, Theo (2013). American Literature: A History. Routledge. p. 229. ISBN 9781135104580. ^ a b c Lamb, Nancy (2008). The Art And Craft Of Storytelling. Writer's Digest Books. p. 255. ISBN 9781582975597. ^ a b c d Duncan, Hal (2014). Rhapsody: Notes on Strange Fictions. Lethe Press. p. 119. ISBN 9781590212615. ^ Matthew, Robert (2003). Japanese Science Fiction. Routledge. ISBN 9781134983605. ^ a b Bee, Robert (June 2008). "Linguistics, Cultural Engineering, and World Building in Languages of Pao and Babel-17". Internet Review of Science Fiction. Retrieved 2014-06-04. ^ Logan, Peter Melville, ed. (2014). The Encyclopedia of the Novel. John Wiley & Sons. p. 582. ISBN 9781118779064. "Soft Science Fiction". Best Science Fiction Books. "Soft-core Science Fiction Movies". IMBD. This page was last edited on 2 April 2019, at 07:06 (UTC).